A parliamentary report of 1777 recorded parish workhouses in operation at Penkridge (for up to 40 inmates), Brewood (30), and Chesland Hay (12). The Penkridge workhouse stood on Cannock Road (formerly Husbandman Street) opposite Reynolds Cottage. Brewood's workhouse was originally on the lane leading to Kiddemore, between the Churchfields and Hockerill, but moved in around 1800 to premises on Bargate. Church Eaton's parish workhouse was erected in 1798. Bushbury erected a workhouse in 1831 at what is now the junction of Primrose Avenue and Bee Lane. The building was remodellws in more recent times for use as a doctor's surgery but the original brickwork can still be seen at ground level. County of Stafford: Acton and Bednall, Brewood (4), Bushbury (2), Cannock (2), Cheslyn Hay, Church Eaton (2), Coppenhall, Dunston, Essington, Featherstone,,Hatherton, Hilton, Huntington, Kinvaston, Lapley and Wheaton Ashton (2), Norton (2), Penkridge (2), Saredon, Shareshill, Stretton, Great Wyrley. 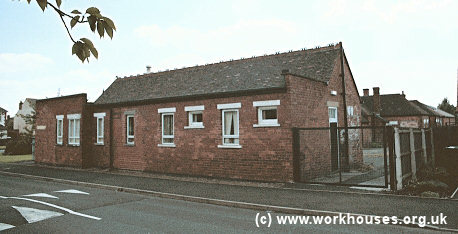 Initially, the new Penkridge Union made use of an existing workhouse building on Bargate Street, Brewood, built in around 1800 and enlarged in 1838. In 1870, a report in The Builder magazine provided details of the building. ERECTION OF A NEW WORKHOUSE FOR PENKRIDGE. The Guardians of the Penkridge Union having selected a suitable site at Cannock, the new workhouse is now being erected under the direction of Mr. Edwd. Holmes, architect, of Birmingham. The general aspect of the proposed building is south. The front block has been set apart for the board offices, immediately behind which is placed the vagrants' and receiving wards. The main block of the building runs parallel with the board offices. The dining-hall and also the kitchen-offices communicate with the main building and schools by means of corridors. The general school, boys' day-room, and play-ground are on the right of the dining-hall, while the girls' are on the left. Spacious dormitories are arranged on the first floor of this building. The infirmary, comprising the sick wards, occupies the western portion of the site, and the fever wards, which are also a detached building, are placed on the north end of the site. The accommodation provided in the main building is for 47 infirm and aged males and 10 able-bodied males, making a total of 57 males ; and for 39 infirm and aged females and 20 able-bodied,—total, 59 females. The dining-ball is 38 ft. by 24 ft. 6 in., and will be arranged so that each class of adults as well as children may assemble without mixing; a division up the centre will separate the males from the females. It is intended to use the dining hall as a chapel. Schools are provided for 24 boys and 31 girls and infants. The accommodation provided for in the infirmary is as follows:-Males, sick, 9; itch, 4; fever, 4; total, 17: females, sick, 5; itch, 4; lying-in, 4; fever, 4 ; total, 17. The method adopted for ventilating the building is by the use of air-bricks covered on the inside with finely perforated zinc, to be inserted at distances of from 8 ft. to 10 ft. apart near the floor level, and over them near the ceiling, except where the rooms are ceiled above the wall-plates, in which case circular ventilators, 16 in. diameter, will be placed in the ceiling and covered on the under-side with perforated zinc. Louvres will also be provided in the roofs. The building will be constructed of brick with stone dressings. The estimated cost is 6,745l. Messrs. Parnell & Son, of Rugby, are the builders. Cannock entrance block from the south, 2000. The buildings were extended in 1886 at a cost of £800 with the provision of detached fever wards. In 1902, £6,350 was spent on the erection of a new infirmary. Cannock main entrance from the south-east, 2000. Cannock front block from the north-east, 2000. On 14th March, 1877, the Penkridge Union was renamed the Cannock Union. In 1930, the workhouse was taken over by Staffordshire County Council and became a Public Assistance Institution, still housing the elderly poor, chronic sick etc. The inmates enjoyed the occasional outing to the countryside or seaside as shown in the picture below from 1937. 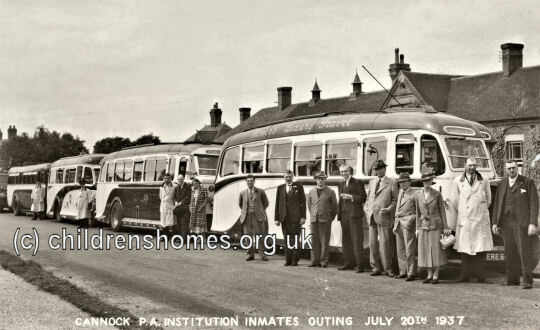 Cannock PAI inmates' outing, 1937. 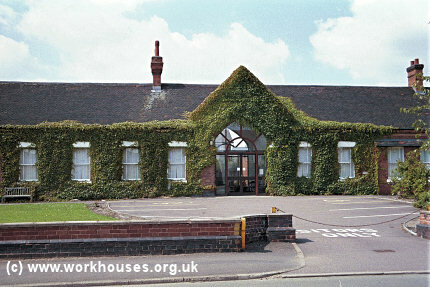 In 1954 my family were sent to live in Ivy house hospital Cannock, which I have found out was previously the workhouse. We lived just inside the main gates on the right hand side, At the back was a small yard and opposite the back door was a room where some old men lived. After about 6 weeks we were moved to a house next door which was called "the Cottage" and another family moved into the accommodation in the grounds. There were 3 families living in the "Cottage" some moving on but we were the longest there. about 6 years. The Hospital then comprised a TB ward, maternity ward , old people, and a nurses' home. We had all sorts living in the Cottage. The women there were always having babies. I do remember men living there. One of these was supposed to have buried a baby in Stafford park. I never knew if it was still born or if it was killed. I used to call that house the House of Horrors. In 2013, the only surviving part of the building, the entrance block, was under threat of demolition. In around 1914, the Cannock Union established a children's cottage home at Old Penkridge Road, Cannock. In 1924, the home could house 31 children and the superintendent was H.H. Rosser. By 1929, the home's capacity had increased to 61. The site later became a Remand Home and then Lynwood children's home. It is now in private residential use. Former Cannock Union cottage homes. Staffordshire Record Office, Eastgate Street, Stafford, ST16 2LZ. Holdings include Guardians' minute books (1836-45); Ledgers (1927-1930); Outdoor relief lists (1836, 1839); etc.